A simple method for limiting how many checkboxes can be checked (and how many checkboxes *must* be checked) on a checkbox field. 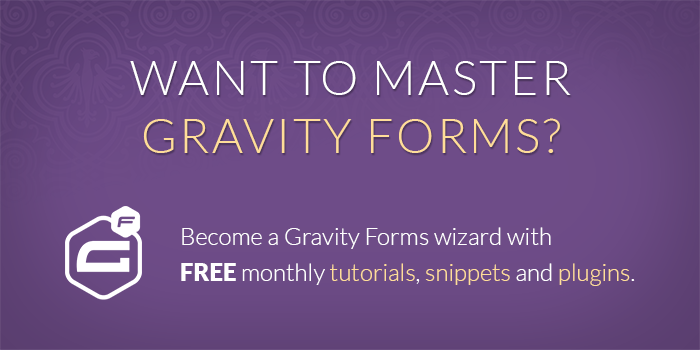 February 9, 2013: Updated to only apply validation on currently submitted page for multi-page forms. The snippet might look daunting but it only requires a quick copy and paste and two simple configurations to get it up and running! Just copy and paste the code into your theme’s functions.php file. Do I need to modify this snippet to work with my form? I see all the page but not the form. Hi Danilo, the demo is still working so there is likely a theme/plugin conflict at play. i face the same issue. it used to be working. For anyone experiencing issues: I had to make this a plugin in order for it to work. I couldn’t get it working just pasting everything in the functions.php, the code wouldn’t output the script to the page containing the form at all. I would recommend the same approach for anyone experiencing the same issue. Both my max fields are 3 but my form is letting 4 be picked, any idea on this? Hi Karl, I’m not able to recreate the issue. I’d recommend picking up a copy of Gravity Perks for the GP Limit Checkboxes perk which comes with excellent support. This is great, but any way where I can set the limits dynamically based on the input of another field? For example.. Since we don’t have proper checkbox products in gravity forms.. (yes I saw https://gravitywiz.com/checkbox-products-gravity-forms/, but I don’t think it’s viable when you have a few hundred options).. A person is buying and selecting seats to a concert..
How many tickets do you want to buy? (Product Dropdown: 1..10). Results of the dropdown will limit the number of checkboxes/seats that they can select. We have a snippet that works in conjunction with our GF Limit Checkboxes perk. https://gist.github.com/spivurno/42ca347547088029b986e2b5287ccaea Happy to answer any questions. Thanks for sharing.. this is good.. I will play with it, I see the configuration section will need to be populated with the ID’s and values.. But it seems to be related to specific values of a dropdown. What if you want a user to enter in any number (i.e. a quantity)? Would this work for (a) spanning mutiple fields (using the Limit Checkboxes Perk) and (b) 2 different limits based for 2 different fields? My initial testing on a site using the limit checkboxes perk, using a “Product” in the form of a dropdown doesn’t appear to be impacting.. Does the “Limit how many checkboxes can be checked” need to be enabled? If so, do we put a min/max limit, or leave blank? In the product, I tried “Show Values” using both numbers or strings like Q1, Q2, Q3, etc.. neither seemed to have an impact.. Any further documentation? Hi Jacob, reach out to us via the support form and we’ll be happy to take a closer look at your setup. Please include an export of your form, your configuration of the conditional limits snippet and the field labels & IDs you are working with. Thank you for supplying this. I have installed it as a plugin instead of all that code in the functions.php file. Hi, I just stumbled onto your code and it works awesome except I have one dilemma. I have multiple field IDs being used in the same form. I added the snippet for each field ID however I need to restrict the form to max out at 15 selected checkboxes for the entire form with the combined field IDs. Is there a way to make it add together what’s taken from a separate field to combine in total for the form? 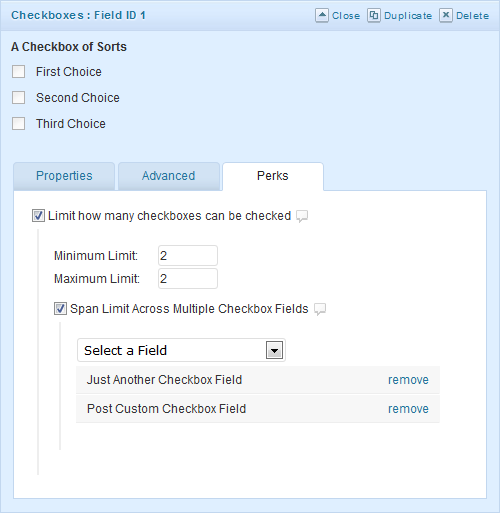 Hi Tim, spanning the limit across multiple checkbox fields is supported in GP Limit Checkboxes. What would I need to do if I wanted this to validate from any page? Hey Greg, I’m not sure you’d ever want this. If it validates from every page, you would get validation errors on form pages that are inaccessible. I would also recommend using the perk-version of this snippet which has been dramatically optimized. RATHER than using the FULL CODE from the “DOWNLOAD CODE” button at the top of the page. The instructions within “How do I install this snippet?” do make it sound as if they only need to copy the small snippet rather than the more extensive code available within the “DOWNLOAD CODE” button. Hi Jamil, glad you found this snippet useful. Drop downs only allow one selection regardless. It is possible to limit multiselect fields but the code would require many changes. 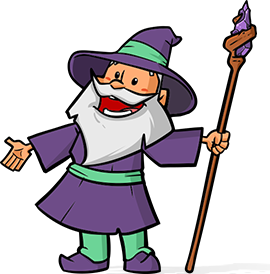 Dear David, Is it possible to apply this to post categories, or product categories in the Woocommerce form? Thank you. Not easily. You’d probably be better off with a custom solution like this. Thanks David! The trouble with all those solutions is that they operate in the browser, which the user can change. I’m interested in having 15 questions, each a checkbox with one option. Do you like scarves? as the question and a single checkbox “yes” underneath. I’ll have 15 such questions but I only want people to be able to select 8 checkboxes, i.e. select 8 yes times. Is this possible since the checkboxes are in different questions? If so, how? And do I need to buy the plugin to achieve this? Yes, this is possible with the GP Limit Checkboxes plugin. It has a feature that allows you to span the limit over multiple files (screenshot). Great little snippet, will come in handy. Any chance you can help me with something? I have two separate checkbox fields, can we combine them so say no more than 7 can be checked between the two checkbox fields? Get what im saying?